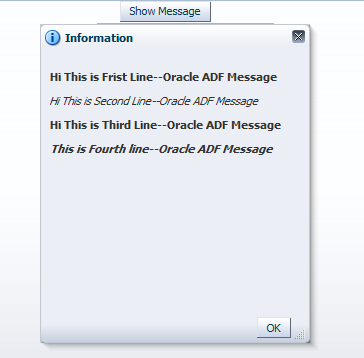 The faces message component is used to show confirmation, warning or informational message in Oracle ADF. 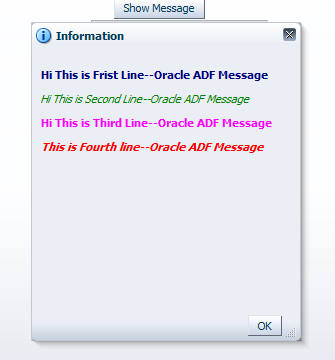 In this tutorial, you will see that how to use FacesMessage component to show Multiline Message. Sometimes we need to show multiline message then how can we implement this? To use for Error and Warning just change FacesMessage.SEVERITY_INFO to SEVERITY_ERROR or SEVERITY_WARN. How can we show HTML table in the ADF faces message? I tried setting up the String — “Records didn’t proccessed successfully.Please check the errors belowBatchIDLine NumberError Message10791Error 2 ORA-01403: no data found10792Error 2 ORA-01403: no data found” in the Faces Message and it printed only content. I think we can not show HTML table in FacesMessage but you can show list using < ol > < li > tag.